Government of Canada Publications: On your MARCs… Get set… Go! Every year, the Government of Canada publishes numerous publications, including research reports, conference proceedings, and much more. Many of these publications are available through the Depository Services Program (DSP) managed by Public Services and Procurement Canada. 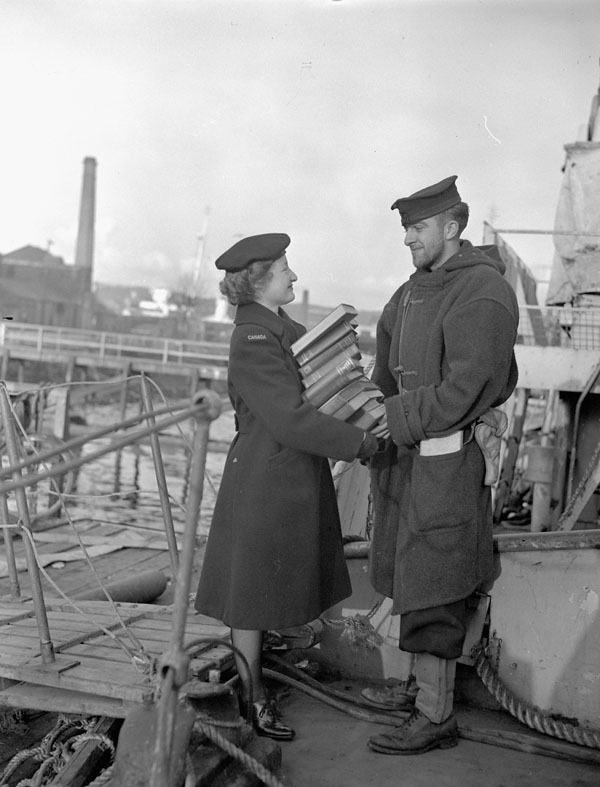 Since 1927, the DSP has gathered and distributed government publications every year to Canadian libraries. With the transition from print material to electronic publications, the DSP has now evolved into a centralized, online weekly distribution service that provides access to electronic government publications. Library and Archives Canada (LAC) has a legislated mandate to be “the permanent repository of publications for the Government of Canada” (Library and Archives Canada Act, S.C. 2004, c. 11). Thousands of government publications are acquired through various means—such as the DSP, donations, and gifts—and in various formats. With the increasing volume of electronic content being published by the Government of Canada, the need for timely, efficient and accurate cataloguing of government publications becomes even more necessary to ensure access and discoverability not only for LAC and its users, but also for all Canadian libraries and their users. Library and Archives Canada’s Government Publications cataloguing team creates high-quality bibliographic records for select government publications from the DSP’s Weekly Acquisitions Lists. 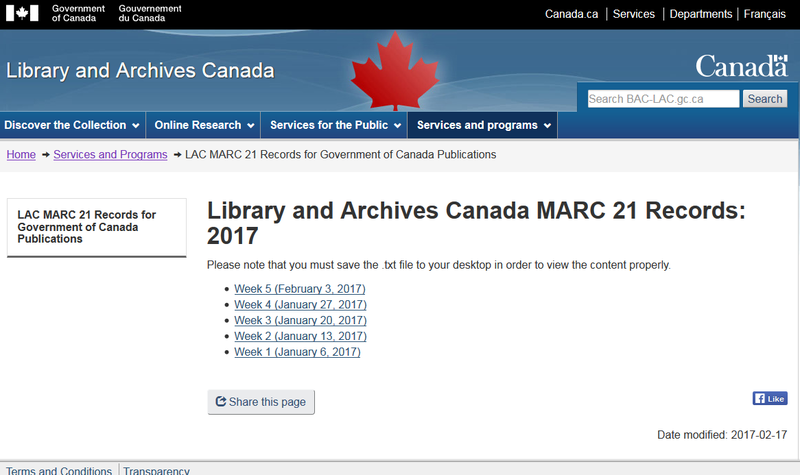 You can access these records by visiting the new LAC MARC21 Records for Govern­ment of Canada Publications webpage. 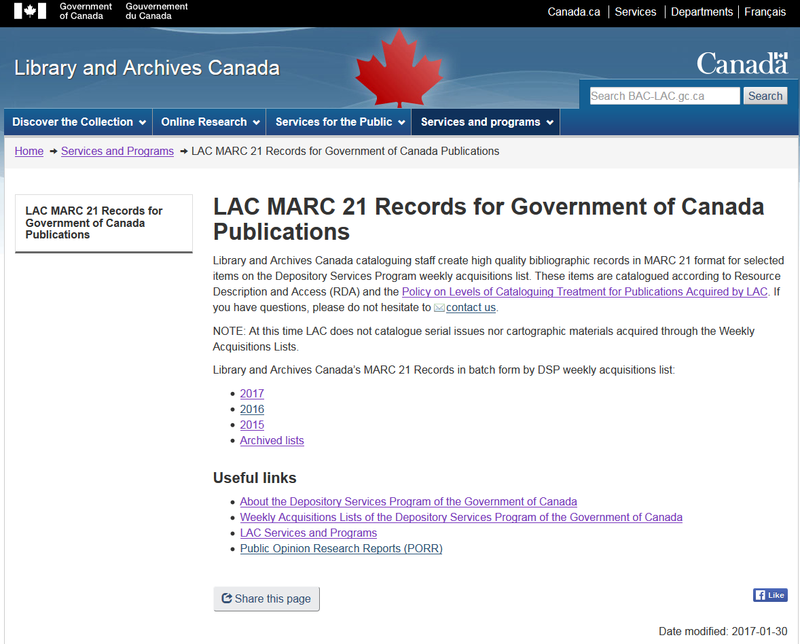 Screenshot of LAC MARC21 records for Government of Canada Publications webpage. Simply click on the year of interest and you will be directed to links for each week of that year. Screenshot of page with links to batch records for 2017 DSP publications. Click a link to open a text (.txt) file containing the batch records for the selected government publications from that week’s list. Download and save to your preferred MARC editor! Questions regarding LAC MARC21 records for Government of Canada publications? Feel free to contact us! This entry was posted in Library, Our Collection and Facilities and tagged bibliographic records, cataloguing, government publications, MARC by Library and Archives Canada Blog. Bookmark the permalink.